Singapore stands at the gateway to the Indian Ocean, the South China Sea, and the Java Sea. At this crossroad, one would expect Singapore to host a mixture of the faunas from the water bodies around it. While this paucity of knowledge is being addressed by the Comprehensive Marine Biodiversity Survey, we know that much of the unknown diversity rests with those animals that are often not seen, literally overlooked, or not easily identified by the naked eye. These include the micro-molluscs, tiny crustaceans, nematodes, and the Bryozoa. The Bryozoa are a phylum of sessile, predominantly marine, filter-feeding invertebrates that occur throughout the world – from the deepest depths to the highest latitudes. Nothing was known about the Singaporean bryozoan diversity until two years ago. Now it is known that over one hundred species occur here (but the fauna is probably in excess of 200 species) and several new endemic bryozoan species are being described. This diversity will be illustrated during the talk, as will the diverse habitats within which they occur. The influence of fouling bryozoan species and their potential for invasion is a concern; several known invasive bryozoan species have already been collected in Singapore. Dr Tilbrook is an authority on the taxonomy and systematics of the Bryozoa. Internationally recognised as a marine invertebrate systematist, his expertise is on the diversity and biogeography of tropical reef-associated bryozoans from the South Pacific. He has worked on specimens collected from intertidal to deep-sea habitats, and fossil faunas from around the world. Currently, he is a Scientific Associate with London’s Natural History Museum and the Santa Barbara Museum of Natural History. 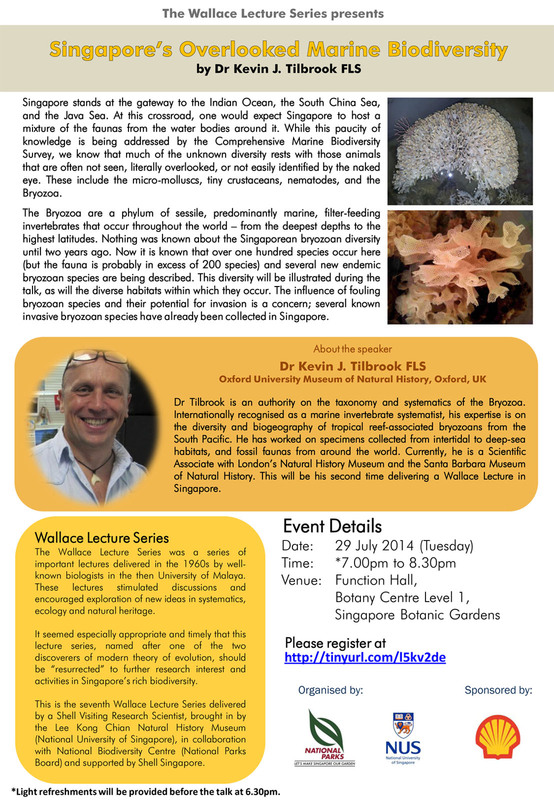 This will be his second time delivering a Wallace Lecture in Singapore. The Wallace Lecture Series was a series of important lectures delivered in the 1960s by well-known biologists in the then University of Malaya. These lectures stimulated discussions and encouraged exploration of new ideas in systematics, ecology and natural heritage. It seemed especially appropriate and timely that this lecture series, named after one of the two discoverers of modern theory of evolution, should be “resurrected” to further research interest and activities in Singapore’s rich biodiversity. 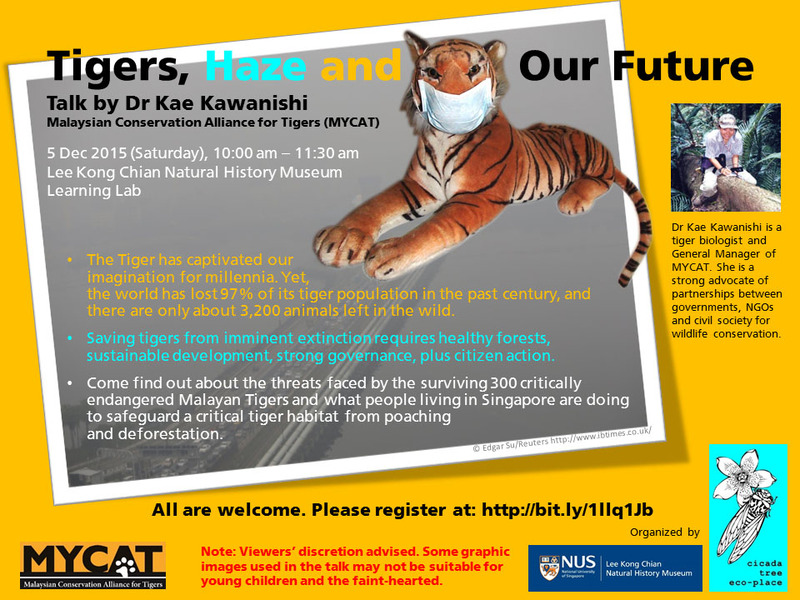 This is the seventh Wallace Lecture Series delivered by a Shell Visiting Research Scientist, brought in by the Lee Kong Chian Natural History Museum (National University of Singapore), in collaboration with National Biodiversity Centre (National Parks Board) and supported by Shell Singapore.